Recent public statements from President David Granger as well as representatives of the PNCR, connotes the intention of removing the names of registered citizens from the register of voters in instances where they are not proven dead at the time of the proposed house-to-house registration. It is pellucid and outright unconstitutional that such moves will realise the real disenfranchisement of voters. Is there any merit that because one works or studies abroad that this wicked clan disavow their rights? The belated and unconvincing reactions by GECOM to clarify this obviously exposed plot speaks volumes and further highlights the unexplained reasons why Patterson refused to further the strengthening of voting verification mechanisms by his refusal of the further necessary action following the United Nations evaluation process. Clandestine efforts of Vincent Alexander and his clique a la Patterson have no place in the required institutional transparency, as it goes against the grain of GECOM’s mandate to be ready at all times for the conduct of elections. It is timely to remind the ‘loop sided spinner’ Alexander that the NCM was put in Parliament before the 2019 budget debate. That the leader of the Opposition Bharrat Jagdeo, in the interest of our people, called on the Government to produce a budget with less pressure on our people. 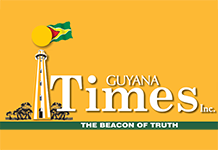 It was widely recognised that the crime rate along with the serious and unbearable massive corruption by the APNU/AFC members was causing irreparable damage that our citizens will not allow to continue in Guyana. It was a decision taken after thorough discussions in our party and with numerous local organisations to alleviate our people of the unnecessary burdens. There are enough reasons, as the pressure on our youths, pensioners, farmers, and people of all lifestyles intensify. We just cannot survive with this skyrocketing cost of living neither would the people tolerate an unconstitutional Government. The APNU/AFC Government insisted that the List was ready for Local Government Elections in 2016 and 2018. They were ready to test their strength in both elections and was ultimately humiliated in both instances. They are now running away from facing our citizens at the polls. The people of Guyana demand transparency at GECOM towards free and fair elections. Only the dead can be legitimately removed from the list of registered voters by GECOM and we demand appropriate steps towards immediate preparedness for the holding of elections, in anticipation of the Caribbean Court of Justice upholding the constitutional directives as advanced by the Opposition.